Blackbeard, the infamous pirate and newest star of the Pirates films, is having his ship picked apart just off the coast of North Carolina. Archaeologists pulled up a 12 foot anchor off the Queen Anne that's been in the 60 feet waters for over 300 years. 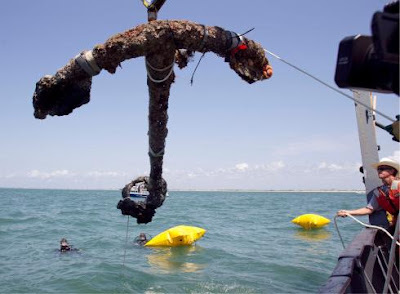 Other artifacts from the ship are the wooden hull structure, ribs, a plank, six cannons and three other anchors. 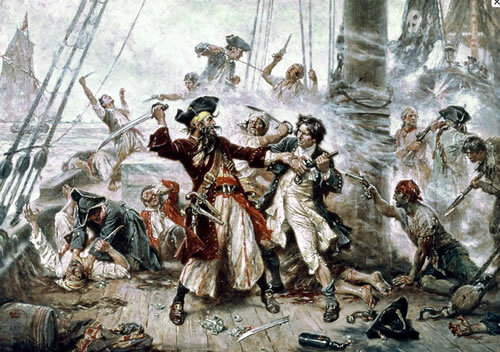 In 1717, Blackbeard captured a French slave ship and renamed it Queen Anne's Revenge. Sometime early on in 1718 Blackbeard lost his ship in the waters of the Atlantic. He was then killed November 1718 by volunteers for the Royal Navy in Ocracoke Inlet in what is now North Carolina. Blackbeard had a fierce battle aboard a Royal Navy ship and died only after being shot no fewer than five times and cut about twenty times. In that final battle it is said, as reported in the Boston News of March 2, 1719, 'Well done, Lad,' he says to the Highlander who wounded him. Then Highlander proceeded to cut off his head.